Back in May 2013, then-Fed Chair Ben Bernanke roiled emerging markets (EM) with the mere suggestion that the Fed might soon pare back its monthly asset purchases under so-called quantitative easing. Such action would mean less new dollar liquidity spilling into the developing world each month. In an episode known as the “Taper Tantrum,” EM currencies, bond prices, and equity prices duly plummeted. Fast forward five years. With the Fed’s preferred inflation measure now at its long-run target of 2 percent, and unemployment at 3.9 percent—below the Fed’s estimate of the non-accelerating inflation rate of unemployment (NAIRU)—might we now be on the cusp of a Tighten Tantrum? We have seen signs of nervousness, with modest EM outflows last month. Yet there are reasons to be less concerned this time around. One is that the Fed may be more reluctant to deviate from its forward-guidance script, as Minneapolis Fed President Neil Kashkari hinted in March—even if quicker tightening is now merited by the data. But the more important one is that the main driver of the EM sell-off five years ago is less conspicuous today. 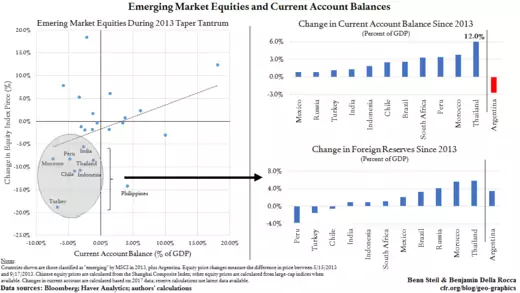 As we showed in 2013, unexpected Fed tightening is most harmful to EM countries running large current account deficits, as these need to be financed with imported capital. Yet as our graphic above shows, there has been near-across the board improvement on this metric since then. (The notable exception is Argentina, which last week hiked its key borrowing rate to forty percent to staunch capital outflows.) Most of these countries’ central banks, moreover, have increased their holdings of foreign reserves, relative to the size of their economies, thereby bolstering their ability to supply liquidity if capital flees. These factors—lower current account deficits and higher reserves—suggest that new Fed Chair Jerome Powell would have to deliver more than the verbal shock Bernanke did in 2013 to provoke a Tighten Tantrum today.